This is a graphical strategy builder. The way it is supposed to be. 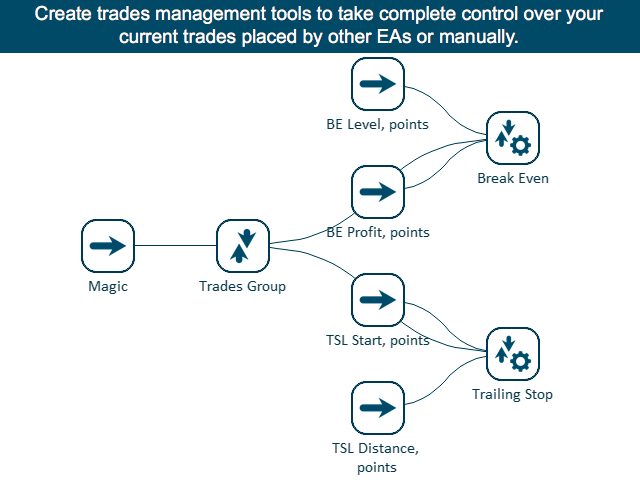 Turn your trading strategies and ideas into Expert Advisors without writing a single line of code. 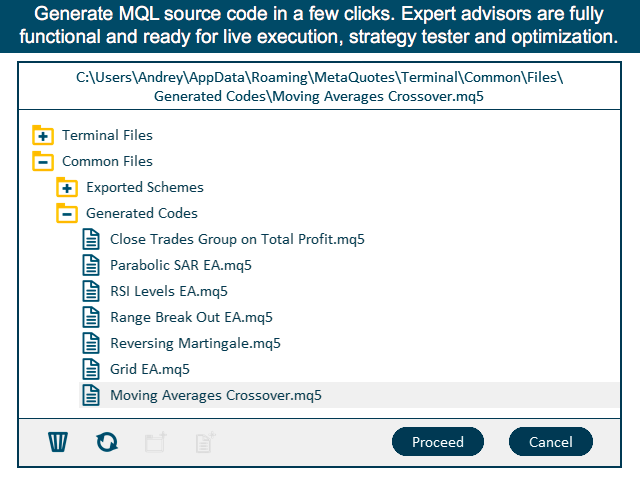 Generate mql source code files with a few clicks and get your fully functional Expert Advisors, which are ready for live execution, strategy tester and cloud optimization. Mission Automate is a "Do It Yourself" solution which converts a complicated process of robots programming into a game. 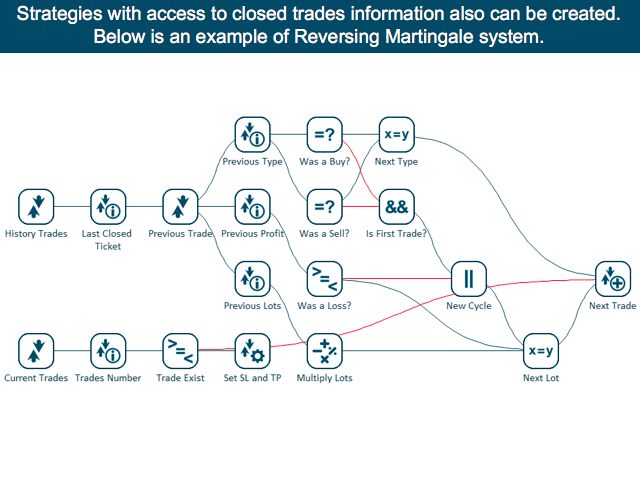 There are limited options for those who have no programming skills and can not create their trading solutions in the MQL language. 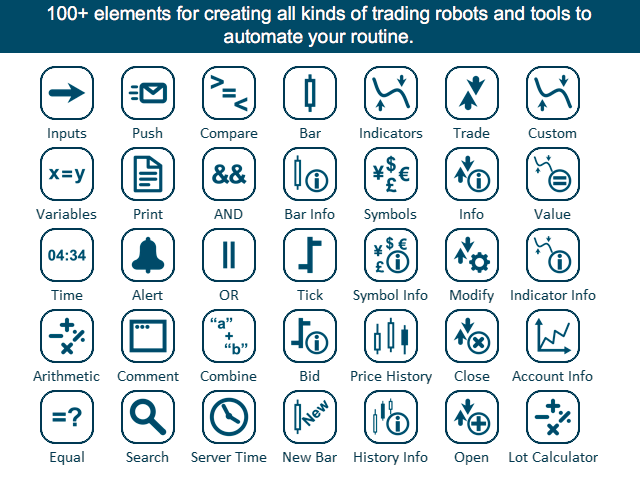 Now, with Mission Automate, anyone can create Expert Advisors and other tools using simple and intuitive graphical interface. Build a system by simply dragging its elements/components into a scheme and connecting them with links. After a scheme is build, it can be either executed live or converted into MQL source code file for further testing in the strategy tester or optimizing its parameters. Monthly rent price of Mission Automate is less than a minimal cost of an order in Freelance section. But this product can deliver unlimited number of trading robots and abilities for their future modifications. 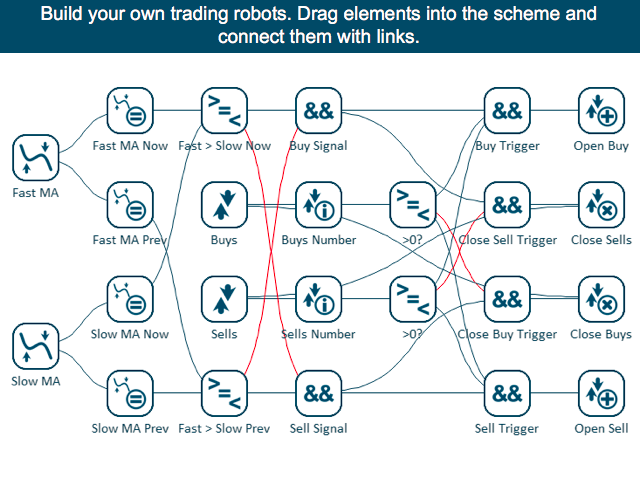 A single solution for both MetaTrader4 and MetaTrader5 platforms: Mission Automate allows you to create both mq4 and mq5 files from any of the platforms. So you can test your strategies using all the power of MetaTrader5 tester and optimization cloud and then run them live on your MetaTrader4 account. There is only one input parameter in Mission Automate: Mission ID # which should be set unique for every instance running in the same Terminal (in case you need to run multiple instances of the EA at the same time). 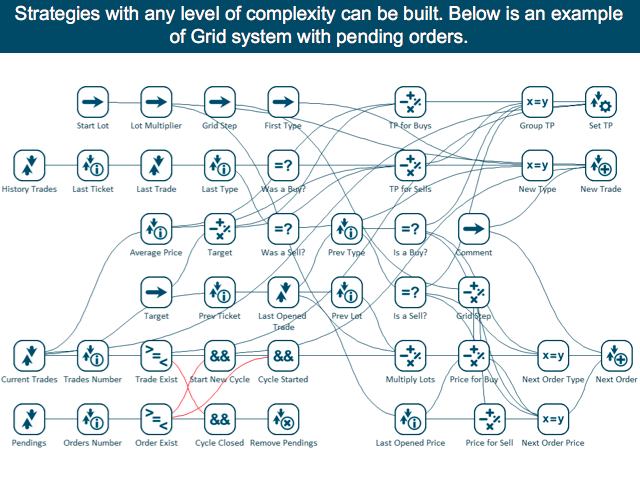 Not all strategies can be created with Mission Automate. Some strategies can not be created automatically. I am a professional developer with 6+ years of MQL programming experience and 1000+ performed job orders as a freelancer. Now my full time job is to create professional solutions for traders. Simple yet powerful product. Quick response to questions. * More code optimisation performed. Even faster generated expert advisors execution and optimisation achieved. * Significantly improved execution and optimization speed of generated codes. Now they are much faster (up to 10 times), without compromising on reliability and stability. * New element "Bar Info (Integer)" has been added. It provides the Volumes and Spread data of the bar. * Fixed an issue which caused wrong Trades Group filtering by Comment in some cases. * Optimized working with schemes. Now the application loads faster when there are many schemes. 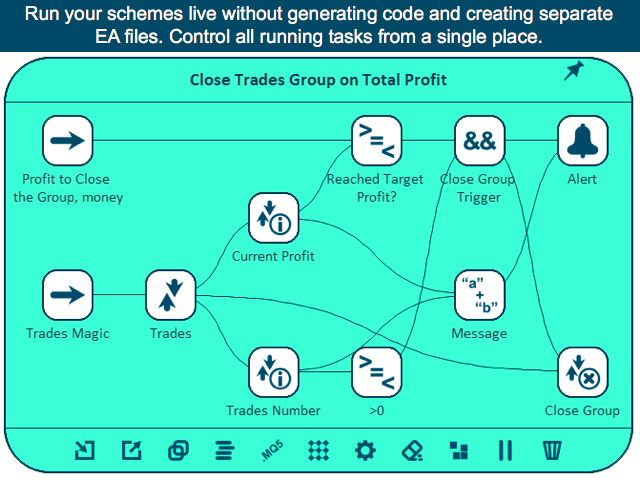 * Added an option to arrange scheme "endings" execution order. This may sometimes be useful , for example, when using alerts before performing some action. * Added a demo version of the product. The link is provided in the description.